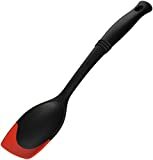 These cool new Le Creuset Revolution Bi-Material Tools are innovative kitchen utensils with flexible and nonstick silicone edges at the tips that bend to scrape and scoop out every last bit from your pots and pans. Apart from the silicone tips, the utensils are made from rigid glass-reinforced nylon for retaining strength along with elliptical handles for a comfortable grip. Available as a ladle, slotted spoon, sauté spoon, or slotted turner. Check out the video demo below to see them in action.